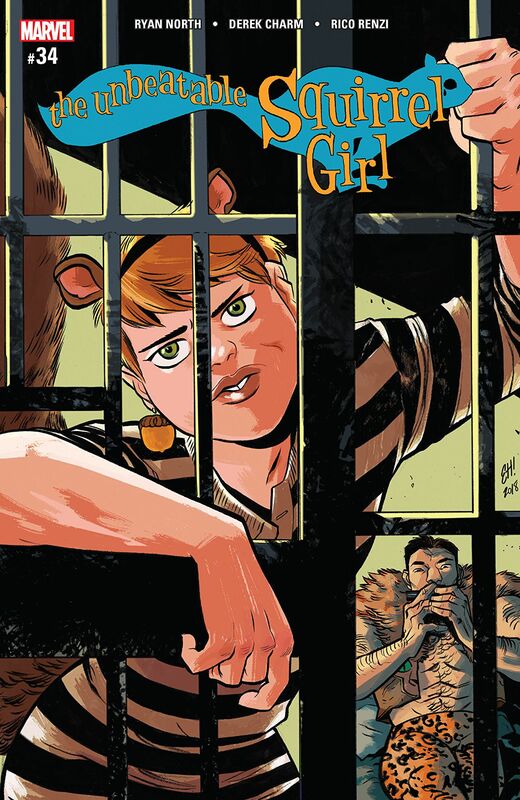 The Unbeatable Squirrel Girl #34 Review – AiPT! What is a hero? What is a villain? Can one become the other? Never afraid to tackle some big issues, writer Ryan North steps full on into the divide between herodom and villainy in the latest issue of The Unbeatable Squirrel Girl. With Doreen, Nancy, Kraven, and the rest in police custody after escaping Mojo II: Electric Bugaloo’s Escape Room of Doom, the question of what makes someone heroic and how much one’s past affects one’s future is front and center in this funny, but strong comic. One of the best things about North’s run on USG is Doreen’s ability to not only see the best in everyone, but to make them want to see that side as well. Kraven the Hunter has been working to reform himself, and Squirrel Girl’s after-school program for villains seems to be on to its first success when the cops arrest them. After a little help from Iron Man over Twitter (follow @unbeatablesg), Doreen at least gets her pals’ secret identities protected, but nothing can keep them from going on trial, faced with the possibility of being branded villains and criminals for their confrontation with the police. After reading through Kraven’s extensive rap sheet, Doreen just doesn’t know if she can trust reformed villains anymore. Brain Drain gives us a bit more of his own background, discussing his past and his attempt to change his future, much like Kraven is doing. In court, we see the return of one of my favorite characters, Single Green Female Lawyer Jennifer Walters, aka She-Hulk in a pantsuit. I was a huge fan of the Dan Slott era She-Hulk and having her back in court, even against such a well-named attorney as Courtney Alaska, is refreshing. It is here that the real dichotomy arises. What is a hero? What is a villain? Can one become the other? Does perspective matter in determining one’s status? Sure, Squirrel Girl has defeated Galactus, but she also bragged about stealing Spider-Man’s web shooters and knocking out the Avengers. I’d be remiss if I didn’t mention the great job that artist Derek Charm is doing creating a style of his own for Unbeatable Squirrel Girl. Even with the drastic change from Erika Henderson’s work, his simpler, adorable style just works for this book. USG is one of those comics that just works with a more cartoony style. More than ever, I want to see an animated SG series in this style. Can you imagine animated Hipster Kraven palling around with this mega-cute version of Doreen? Gimmie! Without spoiling further, there is no one answer here. I’m not sure there should be. In a world where black and white separations between good and evil are longed for, we just don’t have that luxury. In his most popular musical, Into the Woods, Stephen Sondheim explores this idea, putting into lyrics what I imagine Doreen must think as she contemplates Kraven: “Witches can be right/Giants can be good./You decide what’s right, you decide what’s good.” This is from a song at the end of the show titled “No One is Alone.” Alone, good is difficult, maybe impossible. With the support of Squirrel Girl and the team, Kraven could be good. Without that, what chance does he have? One of the best things about North's run on USG is Doreen's ability to not only see the best in everyone, but to make them want to see that side as well. Return of SGF Jennifer Walters! The end of hipster Kraven?